The weather is cooling down, and that means rodents are looking for their own long-term care facilities. Across the country, rats and mice are searching for warm places to spend the winter, and your long-term care facility potentially has everything they need to live to a ripe old age. Whether or not you're located in one of the metro areas that made it onto Orkin's 2017 Rattiest Cities List, it's time to pay attention to the factors that can put your property at risk of infestation and take action now to keep rodents out. Rodent infestations can have a significant impact on your business, from health risks to damage to your property and reputation. Mice and rats carry diseases, including Hantavirus and food poisoning, which are transmitted via their urine, saliva and feces. Rodents also can start fires by chewing on electrical wires or can disrupt a building's foundation by tunneling underground. If that's not enough of a cautionary tale, a rodent sighting can easily gnaw into your bottom line if patients see them and write negative reviews online. To stay ahead of a rodent infestation, it's important to develop an Integrated Pest Management (IPM) program that emphasizes non-chemical techniques, including exclusion, maintenance and sanitation to prevent issues. This is especially important in long-term care facilities where the use of chemical solutions may be limited. An effective IPM strategy includes identifying the rodents that pose a risk, learning the signs of rodent activity and rodent-proofing your facility. House mouse: House mice can be found darting across floors and nesting in nooks. They can even be spotted in voids of appliances, like stoves, dishwashers, refrigerators and bases of cabinets. Roof rat: As their name suggests, roof rats are commonly found in attics, rafters and trees. These secretive rodents like to hide and will find their way inside your building through vents or holes in infrastructure. Burrows and nests: Rats and mice build nests from shredded material like paper, cloth and cardboard. Some rodents like to nest underground, in which case you might see excavated holes along the building's perimeter. Droppings: Rodents leave behind as many as 50 pellets per day. These droppings, which tend to be capsule-shaped, are most commonly found in areas with high rodent activity. Gnaw or chew marks: Rodents' teeth never stop growing, so these pests constantly gnaw to wear them down. Rodents' gnawing leaves behind shallow, parallel grooves that can be found on wooden structures, cardboard and food containers – even plastic ones. They also chew through electrical wire. Grease marks: Rats and mice are creatures of habit and will frequent the same path. In the process, their dirty bodies leave behind dark rub marks on walls, stairways and burrow openings. Seal off All Entry Points: Rats can sneak in holes the size of a quarter, while mice can squeeze their flexible bodies into dime-sized openings. With this in mind, it's essential to seal off any entry points in and around your building. This means installing door sweeps, sealing cracks in foundations and roofs and eliminating gaps around utility lines and boxes. In additions, ensure drains are covered with one-way, rodent-proofing valves to prevent rodents from entering via the sewer. Prevent Gnawing: To prevent rodents from gnawing on your business facilities, pest-proof around exterior vents and drains using metal mesh. If possible, install metal doors or metal flashing underneath wooden doors. Clean Out: Cluttered offices, basements and attics are favorites for rats and mice due to their availability of nesting material, protection and food sources. Cleaning out interior and exterior spaces, including desk drawers and break rooms, is essential to effective IPM strategies. 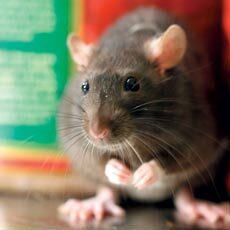 Practice Sanitation: Rodents, like humans, need food and water to survive. The standing water outside your facility, paired with food in garbage bins, can make a pest paradise. Continuously empty garbage bins, clean out dumpsters and check faucets and gutters for leaks. Rodents can erode your business' health, reputation and bottom line. An effective IPM strategy should always be your first line of defense against these pests, and a pest management professional can help assess your business' unique needs. Winter may be coming – but that doesn't mean rodents should find long-term care at your facility.